Suitable for Decal Printing for Bone China, Porcelain, Metal, Plastic, Candle, glass, wood, bicycle, helmet. Best Quality Water Transfer Paper. Decal Transfer Paper for Tattoos: We can supply you plain transfer paper (water slide) for tattoo and Mehandi tattoos for various religious functions. 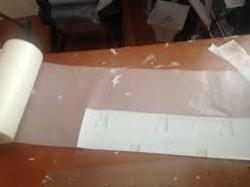 Melamine Transfer Paper (Overlay Paper)This paper is manufactured with clean pulp. Paper has high wet strength, controlled porosity and absorbency. Suitable for printing designs for melamine crockeries. Backed with years of experience we supply and trade the best quality of Signature Laser Transfer Paper. This product is used to print items like textile or leather. They do not cause any harm to the items which gets imprinted instead they are very easy to use and are made with the help of the sophisticated colors and products. Thinking about the changing trend, we offer large array of Inkjet Paper. Our offered products are required for ink jet printing and have long functional life. We manufacture these using latest techniques and are made from high quality chemical pulp. Our offered products are reliable and have good surface strength. Uses: T- Shirts, Mouse Pads, Fabric etc.